andy-williams-in-traffic, originally uploaded by marc_tacoma. Real Salt Lake takes the MLS Cup 2009 from LA Galaxy in a 5-4 penalty shootout after a 1-1 tie in 120 minutes of regulation. Major League Soccer announced defender Omar Gonzalez of the Los Angeles Galaxy as the 2009 Rookie of the Year. Gonzalez started and played in all 30 regular season games and helped the Galaxy achieve one of the best defenses during the 2009 season. Here are the final Power Rankings from MLSnet.com going into the MLS Cup Playoffs. The Columbus Crew stand atop the rankings with LA Galaxy taking the second spot and one first-place vote. Note from MLSnet.com: Power Ranking points are compiled from ballots submitted by a panel of MLS experts. First-place votes are in parentheses. 1 1 Columbus Crew A second consecutive Supporters’ Shield is certainly a welcome prize in Columbus, but along with that prize comes a Conference Semifinal opening leg at Rio Tinto Stadium, unquestionably one of MLS’s toughest road venues. 2 2 Los Angeles Galaxy A convincing win over what had been a hot San Jose side gave the Galaxy the No. 1 seed in the Western Conference, as well as a nice segue into what’s sure to be one of the most heated playoff matchups in league history. 3 3 Houston Dynamo Dominic Kinnear could not have been too pleased to see a 3-0 lead nearly disappear at The Home Depot Center, but after just one win in seven prior league games, the victory was a welcome sight for Houston. About MLS: Major League Soccer is the top-flight professional soccer league in the United States and was founded in 1996, after the country hosted the 1994 FIFA World Cup. MLS kicked off its 14th campaign on March 19, 2009 with the League’s 15th and newest team Seattle Sounders FC making their debut. The new club in Seattle has been a resounding success, averaging nearly 31,000 fans per match. MLS continues to grow as the Philadelphia Union will begin play in 2010 and teams in Vancouver, British Columbia, Canada and Portland, Oregon will become the 17th and 18th clubs in 2011. _MG_1550-42.jpg, originally uploaded by JMaloney. PASADENA, CA – (Aug.1st, 2009) — In front of the largest crowd to see a soccer match in the United State since the 1994 World Cup. FC Barcelona faced the Los Angeles Galaxy in an international friendly. David Beckham‘s first goal since being back with the Los Angeles Galaxy this season was a perfect free kick that beat Barcelona goalkeeper Jose Manuel Pinto into the upper corner. 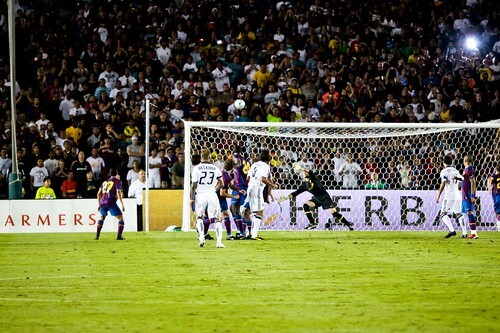 Despite Beckham’s efforts the Galaxy lost to the European champions FC Barcelona 2-1 on Saturday, August 1st. beckhamtie.jpg, originally uploaded by harumphharumph. David Beckham began training with the Los Angeles Galaxy this past Monday for the first time this season in anticipation of his return to MLS on Thursday against the New York Red Bulls at Giants Stadium. However, it is unclear how much time he will see in the match.